Posted on 14, March 2016 by EuropaWire PR Editors | This entry was posted in Belgium, Investment, Small Business and tagged European early stage investment community, KIC Europe, Korean startups and SMEs. Bookmark the permalink. BRUSSELS, 14-Mar-2016 — /EuropaWire/ — Thursday 3 March, KIC-Europe welcomed about 20 representatives of European organisations specialised in the support to startups and businesses in the field of coaching , investment and innovation. On this occasion, Dr Gi Won On, President of KIC Europe and Pablo Garrido, Director of Business Development, officially launched the “Startup Autobahn Programme” that aims at helping Korean companies develop and scale up their ideas and businesses, putting in motion a truly pan-European softlanding programme. Supported by the MISP, Startup Autobahn will allocate 35 grants in 2016 to financially support the companies accepted in this internationalisation Programme. These companies will have to sign up for KIC-Europe’s Membership Package to benefit from the programme, in which KIC-Europe aims to boost the investment readiness of Korean innovative startups and SMEs, promote these companies towards the European early stage investment community and actively facilitate investment matching with seasoned investors. Friday 4 March, over 20 Koreans’ most impactful young tech companies, had the opportunity to expose their business plans to KIC-Europe’s mentors through online pitching sessions. 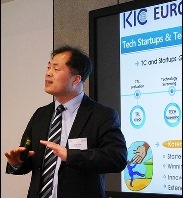 KIC-Europe’s mentors will support the awareness raising of the disruptive technologies exhibited, setting up a runway for Korean entrepreneurs to start and scaleup their business in Europe and grow internationally. Just to name a few, leading European organisations such as EBN, EBAN, Microsoft Innovation Center, Oxygen Accelerator, Startupbootcamp Barcelona, and Segments Accelerator will work closely with KIC Europe to promote the emergence of new Korean talents. European startups interested in the Korean or broader Asian market will also have the opportunity to tee off thanks to the “K-Startup Grand Challenge 2016”. This global startup acceleration programme will promote the expansion of an open entrepreneurship ecosystem in Asia by creating a prominent business hub in the region using Korea as a foothold for international cooperation in Asia.